Earvin “Magic” Johnson, Jr. is the Chairman and Chief Executive Officer of Magic Johnson Enterprises which was formed in 1987. Through strategic investments, partnerships and endorsements, Magic Johnson Enterprises (MJE) provides products and services that particularly focus on ethnically diverse urban communities. MJE is comprised of a portfolio of companies that include Urban Coffee Opportunities (making MJE the only joint venture partner of Starbucks with hundreds of stores located across the country), Canyon-Johnson Urban Fund which is the country’s largest private real estate fund focused on the revitalization of underserved communities, Yucaipa Johnson Corporate Growth Fund which is the country’s premiere private equity fund focused on strategic investments in companies located in and/or serving America’s underserved markets, thirteen 24 Hour Fitness Magic Sport centers, a T.G.I. Fridays restaurant, and a long-standing partnership with AMC Magic Johnson Theatres. MJE recently launched several additional initiatives: SodexoMagic, LLC and respective partnerships with Aetna and Best Buy. SodexoMagic, LLC provides an extensive portfolio of food and facilities management services as well as offers signature dining facilities. MJE’s alliance with Aetna will empower businesses and ethnically diverse communities to make informed choices about health care options by improving health care literacy and demonstrating the benefits of wellness. Similarly, MJE has entered into a multi-year relationship with retail giant Best Buy to enhance urban retail growth strategies and implement diversity outreach with multicultural consumers. Mr. Johnson’s newest venture MAGIC Workforce Solutions (MWS) will provide “best in class” staffing services and connect employers of today with the workforce of tomorrow. The aforementioned businesses have been at the forefront of urban development, raising the understanding of the importance of the multicultural consumer, and are directly responsible for tremendous growth across the country. Through MJE, Mr. Johnson has bolstered the economy by establishing brand name businesses in underserved communities, training and hiring local residents, employing local contractors, and opening the door for other businesses to find success in diverse communities. In addition to his varied business accomplishments, Mr. Johnson was voted (unaided) number one at representing the urban community, garnering a higher percentage than any other organization or personality (February 2008 Yankelovich/Magic Johnson Brand Study). He was also voted the number one rated athlete for corporate endorsements (TSE Sports & Entertainment Survey, April 2007) and one of the most highly rated celebrities able to influence consumer purchasing power (rated 6 out of 350 according to the 2006 Davie Brown Index). As Chairman and Founder of the Magic Johnson Foundation, Inc., Mr. Johnson is dedicated to developing programs and supporting services that address the educational, health and social needs of ethnically diverse, urban communities. Founded in 1991, the Magic Johnson Foundation (MJF) has become one of the most recognizable charitable organizations around the world. Over the past few years, the MJF has awarded more than $1.1 million to community-based organizations that focus on HIV/AIDS education and prevention, established four HIV/AIDS clinics and has co-created the award-winning “I Stand With Magic” campaign to end HIV/AIDS in the black community. Additionally, the MJF has supported more than 800 minority high school students with college scholarships (many through the organization’s Taylor Michaels Scholarship Program), opened 20 Magic Johnson Community Empowerment Centers located in underserved communities across the country, and provides a range of community-based initiatives including an annual kid’s Mardi Gras, holiday toy drive and semi-annual job fair. Mr. Johnson is universally known for his 13 year career in the NBA. His honors include: five national championships with the Los Angeles Lakers, 3 MVP awards, 12 NBA All-Star games, a gold medal at the 1992 Olympics in Barcelona, Spain and induction into the Naismith Memorial Basketball Hall of Fame. Mr. Johnson is also Vice President and part owner of the Los Angeles Lakers. Do you want to hire Magic Johnson? Directly request a quote. 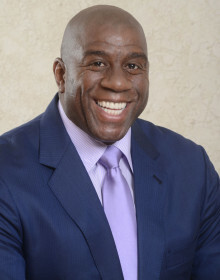 In 48 hours we can send you the availability of Magic Johnson If you would like to book Magic Johnson, Entertainment Booking Agency is the right place. We will offer you the best price and contact the management or we directly contact Magic Johnson. For corporate appearances or speaking engagements you can contact our agents and the will help you true the process. Tags: hire Magic Johnson, Magic Johnson booking, book Magic Johnson, Magic Johnson appearances, find more information on booking Magic Johnson for appearances, Magic Johnson speaking engagements, Magic Johnson endorsements/spokesperson, Magic Johnson appearance fees, Magic Johnson booking agency contact info, biography of Magic Johnson, Contact an artist booking talent agent find a speakers bureau that can book Magic Johnson, speaker booking agency for Magic Johnson, Magic Johnson booking agency, Magic Johnson booking for corporate event. EBA is one of the biggest entertainment booking agencies in the World. We book hundreds of celebrities, artist, athletes and speakers in a year. Important to know is that we are not claiming to be the management of Magic Johnson. We are not the official agent for Magic Johnson. Companies from around the globe book these artists and speakers true our company be course we have one of the biggest networks and we always have direct contact with the artist or the management. We help you to find the right celebrities for your corporate of private events. Please contact one of our agents to get free advice and we will help to get the world-famous artist on your party.